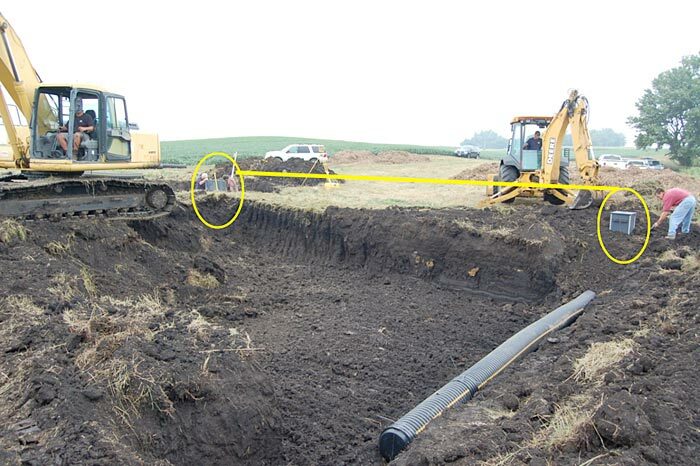 Bioreactor installation: The yellow circles indicate the locations of the control structures. The yellow line is where the main field tile is located. The exposed tile collects the water after it flows through the bioreactor and feeds into the lower control structure (circled on the right), which flows back into the main tile line. 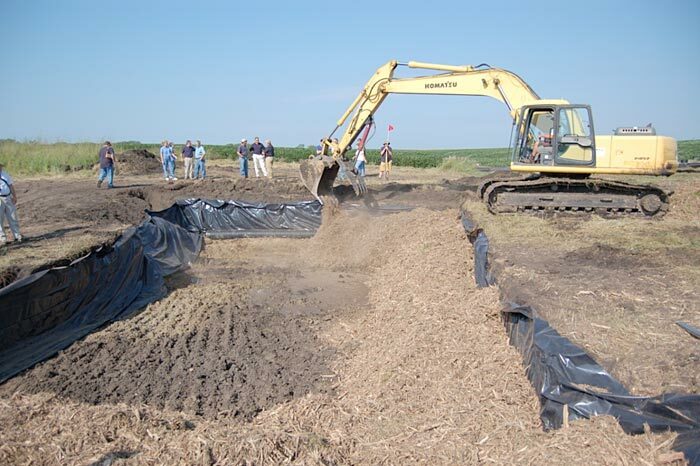 A bioreactor is a buried trench filled with a carbon source (commonly wood chips), through which tile water is directed to flow. The carbon source provides material upon which microorganisms can colonize. Using wood chips as a food source, the microorganisms begin breaking down nitrate in the water and expelling the nitrate as nitrogen gas, a primary atmospheric component. The bioreactor has no adverse effects on crop production and is designed so it does not restrict drainage. A control structure determines the amount of tile flow diverted into the bioreactor. During periods of high flow, excess water bypasses the bioreactor and continues to flow through the existing field tile. In most locations, bioreactors do not necessitate taking any land out of production. They are installed below filter strips or at the edge of the field. Bioreactors begin removing nitrate immediately with the first water flow. They can be installed in landscapes where wetlands are not suitable. 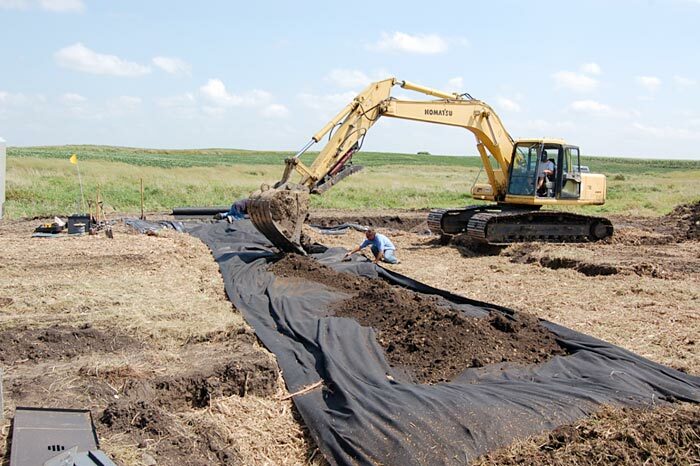 Compared to a wetland installation, bioreactors are more economical to put in place. The bioreactor is filled with wood chips. The plastic on the side walls minimizes the water moving in and out of the structure. Geo-fabric is laid over the wood chips to prevent soil moving into the bioreactor, which could clog the bioreactor and reduce efficiency. Approximately 18 inches of soil was placed over the fabric.